Synopsis: When soldiers in World War I refuse to continue with an impossible attack, their superior officers decide to make an example of them. 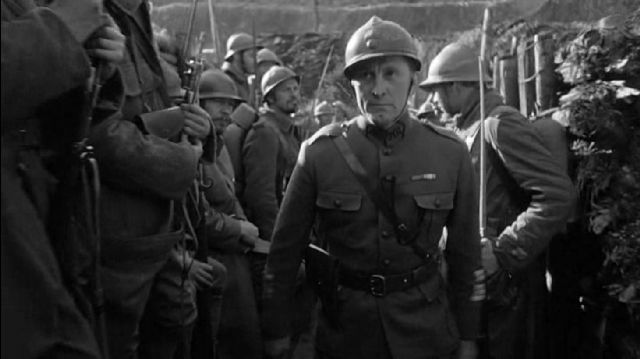 Kirk Douglas finds himself negotiating the brutal, claustrophobic trenches of 1916 in Paths of Glory, Stanley Kubrick’s own first shot at glory following a trio of ultra-low budget efforts — one of which he effectively disowned, and two others — Killer’s Kiss and The Killing, which earned him something of a reputation as a director of modest Noir crime thrillers. That he was able to bag Douglas — then at the top of the Hollywood pile for the lead role (Gregory Peck was also interested) — is a measure of the quality of the script. Kubrick’s own unerring eye for detail and an astonishing battle scene that places the audience right in the midst of battle in a way it never had before, combined with that intelligent script, ensured that, even if the audiences never materialised Hollywood at least sat up and took notice. In the darkest days of WWI when, in the words of the film’s opening narration, an advance measured in hundreds of yards was considered a substantial victory, the French high command decide that a small hill known as The Anthill must be taken at all costs, even though the anticipated price will be the lives of more than half of the men in Colonel Dax’s (Douglas) company. The mission is almost certain suicide, but Dax’s superior, the vainglorious General Mireau (George Macready) accepts under gentle pressure from his own commanding officer (Adolphe Menjou), whose mostly jovial demeanour suggests that he seems to look upon the political intrigue and manipulation at work within the high command as a game designed for his own particular enjoyment. The assault is a disaster. Doomed to failure from the outset, things go from bad to worse when a cowardly officer under Dax’s command fails to send his troops into the battle, leaving Dax’s company fatally exposed. Enraged, General Mireau demands that his own men’s position is bombed in order to scare them out of the trenches and into battle, but the officer receiving the illegal order refuses to comply. The General instantly demands that one man from each company is court-martialled and shot by firing squad as both a punishment and an example to the rest of the men. The incompetence and arrogance of military brass has long been a favourite of moviemakers, and Paths of Glory stands as one of the most intelligent and dramatically rewarding examples. There’s a cynical, hard-bitten edge to the dialogue which may well be down to the contribution of Jim Thompson, one of pulp literature’s darkest — and most damaged — practitioners. While Douglas enjoys centre-stage, and Macready makes the most of a memorably villainous role, it is the three condemned men who make the strongest impression. Picked at random or to settle personal scores, none of them are cowards, and each deals with their plight in differing — but equally believable — ways. Their treatment — which was apparently based on real events — is truly sickening, making a mockery of the banners of nobility and honour beneath which the military mighty posture.